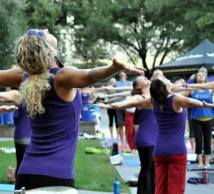 Created in 1999 in Austin, Texas, Free Day of Yoga has blossomed into an event with thousands of participants each year. Since then Free Day of Yoga spread across Texas to Houston, Dallas/Fort Worth, Victoria, Katy, and Nederland, and beyond the Texas borders to Beckley, WV; Los Angeles, CA; Philadelphia, PA, and even as far as Guam! In 2012, Free Day of Yoga made its debut in Sacramento, California. All day long, on Labor Day, participating studios throughout the Sacramento region offered free classes as an opportunity for people of every age and fitness level to try yoga for the first time, experience a new style of yoga, visit a new studio, take class from a new instructor, or share yoga with friends and family. That first year, 16 studios held over 30 classes and hosted 1000 students. Each year since, studio AND student participation has doubled... and tripled. Sacramento Free Day of Yoga and Free Yoga Sacramento aim to bring area studios together to make yoga accessible to all people, breaking down the barriers of cost, style, and level of experience. Every Labor Day studios across the greater Sacramento region offer free yoga classes share different styles of yoga that can fit everyone and every body. Free Yoga Sacramento is a local resource list of free and/or donation-based yoga and meditation classes offered throughout the year to the practice available and affordable for everyone.